You wouldn’t normally think of Matchbox Vintage Pizza Bistro in Short Pump as a brunch spot based on its name, but you’d be deceived. I have had several friends brunch here in the past, including Sara, and all had delivered rave anecdotes. I had been meaning to try it, too, especially since Matchbox has participated in Richmond Brunch Weekend for the last two years. Thankfully, last weekend I got to check out their menu with Sara. Even better, we got to try out their newest menu – a bottomless brunch they’ve labeled the “Brunchbox.” Our special invitation came with a caveat: we had to be filmed for a promo Matchbox was shooting. Because of this, we didn’t get a lot of great photos we took. Instead, we had to take bites of the food for the camera before we could snap our own. For that reason, we’re using photos taken by local food photographer Deb Lindsey. 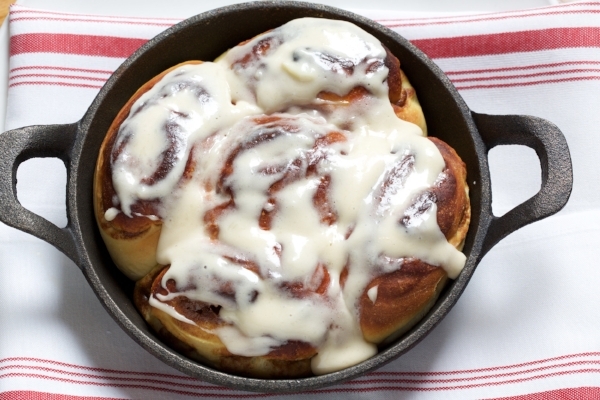 Cast iron cinnamon rolls that we forgot to order. Photographed by Deb Lindsey. Matchbox Short Pump is only the second location in the Matchbox franchise to offer the bottomless brunch option, but it will soon be rolled out at all their locations throughout the Virginia/Maryland regions. And Sara’s and my faces may be in the promo videos for all of it (eek, I hope they blot out the zit on my cheek!). Chilaquiles breakfast nachos. Photo by Deb Lindsey. We’re super glad to see a bottomless brunch option hit the Richmond, VA region. “Bottomless” doesn’t seem to be a thing here except for select occasions, but both Sara and I have enjoyed our fair share of bottomless options in other cities like Washington, D.C. (duh) and even Orlando. The Brunchbox launched November and offers an unlimited selection of small plates for $31.50, plus Bloody Mary’s and mimosas for $3 each. (That price for a mimosa may be even more of a steal!) If you have any kids, it’s $12.95 for them. If you’ve been to Matchbox before for brunch, they’ve kept their existing favorites and added about 16 more small plates. Food is delivered as it is prepared, so you may order seven small plates like we did on first go, but not all seven will arrive at the same time. The first two plates to arrive for us (besides the beverages) were the brunch pizza and the chicken and waffles. While I was the one who insisted we order the pizza, this may be my largest regret because it arrived first and it’s so large. These are all great qualities in a food order unless you’re trying to fit a bottomless amount of food inside of you. Topped with sausage, Spanish onions, smoked gouda, scrambled eggs, pico de gallo, and chipotle sour cream, this was heaven, and we almost finished all six slices before realizing we did need to save room for six more plates. We loved the chicken and waffles. It’s a large hunk of crispy fried chicken atop a quarter waffle. It needed a bit more syrup, but we forgot about this minor detail when our next courses landed on the table. I also insisted we order the veggie scramble, which consisted of egg whites, spinach, cremini mushrooms, tomato, and gruyere cheese. I appreciated this dish because it’s super healthy and heavy on the mushrooms; however, it’s not nearly as tasty as the other items we ordered, so I’d pass if I came back and get more flavorful (read: less healthy) options. Blueberry muffin French toast. Photograph by Deb Lindsey. Sara and I both ranked the pastrami smoked salmon scramble as our favorite dish. It’s a healthy filling of salmon and eggs topped with red onions, capers, spinach, and cream cheese. She and I also fought over the fried chicken and grits. We accidentally got a second order of chicken and waffles, so I stole the chicken from that dish to finish off the grits. On the sweeter side, we devoured the lemon pound cake French toast and then decided to also order the blueberry muffin French toast. The lemon pound cake version came deconstructed so we could apply blackberry Riesling sauce and strawberries to the French toast in our preferred amounts. Brunch pizza, coffee, + chicken & waffles. Photo by us. At our brunch’s conclusion (this was an involuntary decision in the sense that our bodies decided we were done eating; Matchbox give you two hours if you can keep going), we made a list of all the items that we would order when we return very soon. These includes the chilaquiles breakfast nachos (chips topped with chorizo, pico, chipotle sour cream, and a sunny egg! ), shrimp and grits (enough said), braised short rib hash (with hollandaise! ), cast iron cinnamon rolls, and my two biggest regrets that we didn’t order – the Matchbox Ultimate Breakfast Sandwich Club and the Mini Walk of Shame burrito. The Walk of Shame doesn’t appear so mini once it goes by you to another table. Their Bloody Mary and mimosa options also get a bit more creative at the $10 price point. I really wanted to try the Pizza Pesto bloody (completed with hand-pulled mozzarella, pepperoni, and basil pesto) or the pineapple ginger mimosa (I don’t know how else to describe that one to you). Sara and I are already planning to bring a group of friends back next month. We’d love to hear others’ thoughts once they check out the menu!